Repairing or Replacing Boilers is no problem for our Engineers. All our Heating engineers are Gas Safe Registered and are available when you need them the most. Luxury full Bathrooms installations to Bathroom suite changes. We can do it all and to a budget that works with you. True Underfloor Heating Repair engineers that can repair all types of Water and Electrical Underfloor Heating. Have a Leak? We use thermal imaging to detect leaks, radiator faults or valves installed incorrectly. Solar Flushing, replacement Solar fluid or just a repair to the system. We Repair all types of Solar Hot water Systems. 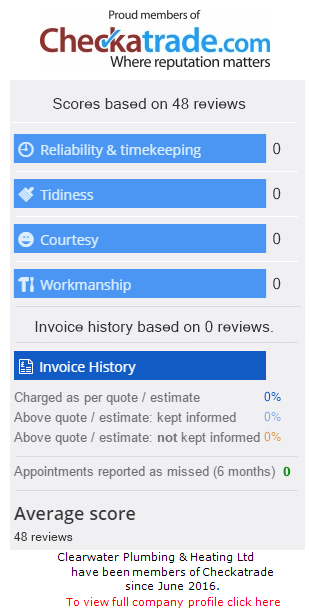 At Clearwater Plumbing & Heating in Grays Essex we aim to provide high quality standards at all times. We are a family run, warm welcoming company that is polite and caring. We Have plumbers in Essex and London and cover all the surrounding areas. Enter your Postcode in the Postcode search to check if a Engineer is in your area. Boiler service and quote for poor performing radiators. Problem identified. Ordered part and returned to fix issue. Comments: "Great job, very tidy, punctual, rang before arriving. Really impressed." Moved stench pipe fittings and new connections. Arrived after the allotted time but phoned in advance to let me know that they were running behind which I appreciated. Very friendly and polite got on with the job no mess made quite happy to answer questions. Helped solve problems with radiators. Will definitely use again.